Home Blogs Cave living: Not just for bears! Cave living: Not just for bears! SOMETIMES a place hides itself from us. It waits for you to uncover it. Piece by piece. The first day I had a moment to myself I started walking the streets of my new town, Guadix. It was rainy and there was the chill of fall on the breeze. I could smell smoke as I wound uphill. As I came over the crest of a hill I suddenly felt disoriented. There were chimneys sticking out of the ground and little doors in the side of the clay walled hills. I felt like I had walked into a scene from Lord of the Rings. Almost half of Accitanos (people from Guadix) live underground in cave houses, and I had just stumbled into their neighborhood—Barrio Troglodyte. 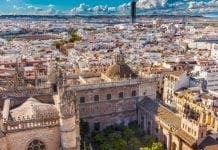 Since the Moorish times, Andalucíans have been fond of living underground because it is the best way to keep cool in the summer. Caves are about 70 (21C) degrees year round. They are made by hollowing out a space in the hard dirt and then building a wall in front of it. Each time I step inside one I am met with a blast of cool air and an earthy smell. The walls are covered with white plaster to keep them from falling in. 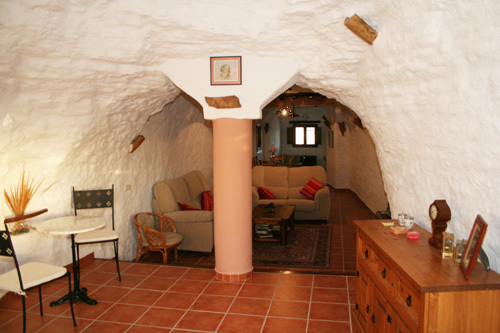 There has been a recent renaissance in cave homes in Guadix—some expats even buy them for summer vacationing. They come equipped with all the modern conveniences of any 21st century house: Marble floors, running water, fully working kitchens and bathrooms, cable TV, and Internet. to read your brief articles. ’til next time! Nice. Would love to hear more about the caves and the community.